The dotted line represents the hub box which is a box attached to the back of the dish. This box houses the LNA, HPA and waveguide filters as described below. The circulator is used to make sure that the transmit signals go out through the dish and not back into the receive chain. It also makes sure that the receive signals come from the dish into the receive chain and not into the transmit chain. It works much like a roundabout in principle. This is often referred to as an Orthomode Transducer or OMT and is, these days, built into the feed assembly. It can also be a polarisation device but they all do the same job, except that polarisation is not necessarily between Transmit and Receive but can be between Vertical and Horizontal Linear polarisation or Left Hand and Right Hand Circular polarisation on both the Transmit and the Receive. This will be discussed more later. The Rx or Receive filter (more often referred to as a Transmit Reject Filter) is usually a waveguide filter which tightly controls the frequencies allowed into the receive chain. This has the effect of reducing the unwanted noise from space and prevents interference from outside of the receive band of frequencies. This is often built in to the feed assembly. The Transmit signals, which are of a very high power compared to the wanted satellite downlink receive signals and can spill into the receive band, are prevented from saturating the receive chain input. The Tx or Transmit filter is usually a waveguide filter which tightly controls the frequencies allowed out of the Power Amplifier and out of the antenna. This has the effect of reducing the unwanted signals from being accidentally transmitted onto the stallite and prevents interference to outside of the transmit band of frequencies. This is often built in to the feed assembly. Even with these filters fitted, the transmissions can be received on adjacent satellites if they are positioned closely in the orbital arc of geostationary satellites. This has the effect of transmitting on two or more satellites at the same time and can cause a lot of interference to users on the other satellites. The LNA (Low Noise Amplifier), sometimes known as an LNB (Low Noise Block which is an LNA plus a Block Down Converter) or an LNC (Low Noise Converter) is a very good amplifier which has the job of amplifying the small signals picked up by the antenna without amplifying the noise. Various kinds exist which all do the same thing, they provide enough signal level to demodulate the data from the carrier. The LNB is more than just an amplifier as it can also handle polarisation selection in some cases and the first stage of down conversion to L-Band frequencies. Polarisation is just like a UHF TV or Terrestrial Radio signal and can be horizontal. vertical or circular polarised. The HPA (High Power Amplifier), otherwise known as a TWTA (Travelling Wave Tube Amplifier) or an SSPA or SSHPA (Solid State <High> Power Amplifier), has one job. It amplifies a specific band of frequencies by a large amount, sufficiently large to enable the antenna to beam them up to the satellite. These can range in power from a few watts up to several 1000 watts in power. The largest HPAs have to be cooled using liquid nitrogen and resemble electron microscopes. The smallest look more like a lump of metal bolted to a small heatsink. The down converters 'do exactly as they say on the tin', they convert signals down in frequency. The signals arrive at the dish at anything from 3 to 40 GHz and are then filtered and amplified, they now need to be moved down the frequency spectrum so that the equipment can be made cheaper and easier. The 1st downconverter mixes the signals with another frequency, the result is both the sum and difference of the signals. By filtering out the original and the sum frequencies the result is that the original frequencies are now the difference frequencies - lower down in the frequency spectrum. An example would be the downconversion of 10 GHz to 1 GHz which is Ku band to L Band, this is then ready for the demodulator. The up converters 'do exactly as they say on the tin' aswell, they convert signals up in frequency. The signals are sent to the up converters at at around 70 MHz. They now need to be moved up the frequency spectrum so that the HPA can amplify them and transmit them through the antenna. 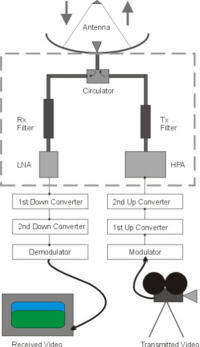 The 1st upconverter mixes the signals with another frequency, the result is both the sum and difference of the signals. By filtering out the original and the difference frequencies the result is that the original frequencies are now the sum frequencies - higher up in the frequency spectrum. An example would be the upconversion of 70 MHz to 1 GHz which is IF to L Band, this is then ready for the HPA to transmit through the antenna. As mentioned previously, these two units are often combined as one and are known as modems. Just like the computer modem you may have at home, these units take digital data and modulate it onto a carrier and they demodulate the digital data from a carrier. Computer modems use audio frequency carriers but the end result is the same. The data isn't always provided in digital form to the modem. Often, especially in digital TV, the input is analogue and a converter before the modem, known as an encoder, converts from analogue to digital. This is usually then compressed into one of many video compression formats. The outside broadcast cameras on the news, plug into the satellite system as ordinary analogue video. This is then converted to digital data and is modulated onto the carrier. The received data is converted from digital data into analogue video by another converter, known as the decoder, after the demodulator side of the modem. This video is then viewable on a video monitor. Increasingly, the analogue domain is disappearing and audio video is immediately encoded into digital and the end user platform (a television for example) accepts the digital format. Such is the pace of technology. Next we will look at the satellite.